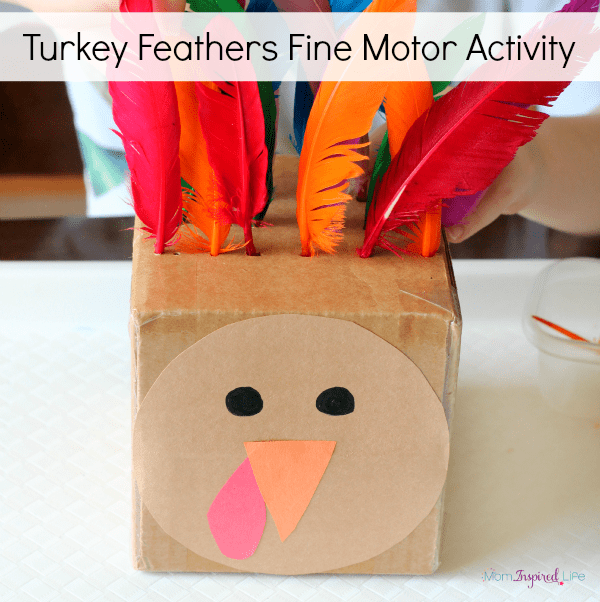 This turkey feathers fine motor activity could not be any more simple to set up! 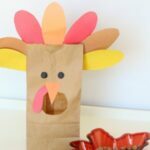 It’s perfect for the Thanksgiving season and fun for toddlers and preschoolers! My kids can’t get enough of turkeys this year. 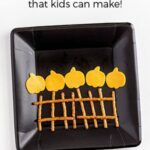 We had a blast with the racing turkeys number line game and the feed the turkey counting game, so I decided to throw together this quick turkey feathers fine motor activity. My toddler couldn’t get enough of it. She has been playing with for weeks now! That’s saying a lot! 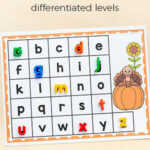 It was also an excellent way to work on color recognition, counting and patterning! I love how versatile and open-ended it is. 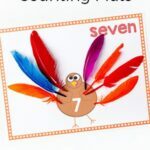 Check out these turkey counting mats for even more fun and learning this Thanksgiving! 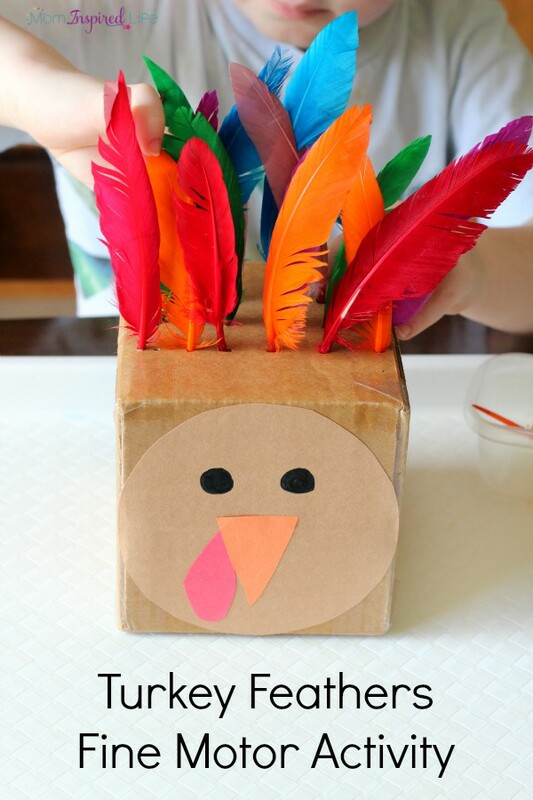 Tape the box up and poke tiny holes in the top of it with a push pin. I moved the push pin around a bit to widen the hole. 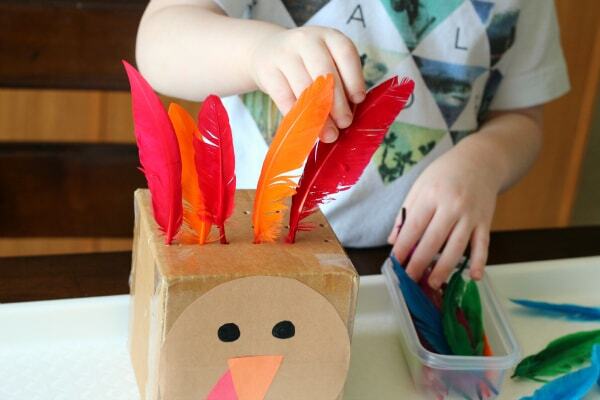 Make sure you don’t make the holes too big or the feathers won’t fit tightly. I used a small bowl to trace a circle onto the brown construction paper. Make sure it will fit on one side of the box. Glue it on. Draw and cut out a small beak from the orange paper and a wattle from the red paper. Glue them on the brown circle. 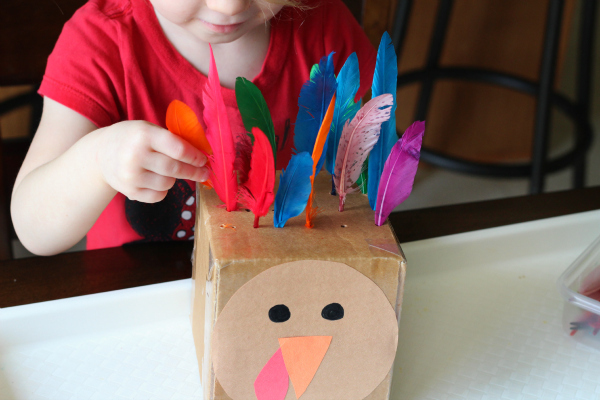 Use the black marker to draw eyes on the turkey. It only took me about 5 minutes to make the whole turkey. It really does come together quickly. I left the turkey and the feathers out one day after nap time. The kids quickly spotted it and ran over to check it out. They were excited to play with it and got right to work. They enjoyed sticking the feathers in the holes and designing their own turkey. It was awesome fine motor practice for my two-year old. It was just the right amount of challenge for her without being frustrating. She improved so much while playing with it too. We also talked about the colors of each feather a lot. My daughter is really starting to remember color names and this activity has been an integral part of that! After she played for a while, my son and I used it for a patterning lesson. I started a pattern with the feathers and then he finished it. Then he started a pattern and I finished it. Eventually he was making all kinds of patterns on his own. He also counted the feathers without any prompting from me. 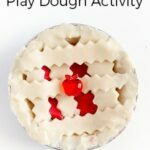 It has been a great way to give my kids some extra fine motor practice and develop some other skills at the same time! 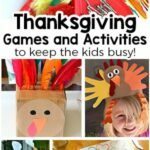 Here are some more Thanksgiving turkey activities I think you will enjoy!